is foam-creating coating for increase of fire resistance and for creation of hardly flammable surface treatment on wooden constructions and particleboard materials. 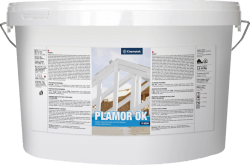 Plamor OK V 2026 is registered to class B – s1, d0 in terms of reaction to fire. The coating creates the foam by impact of fire and thick thermal insulation layer is formed. This layer signifi cantly prolongs fire resistance of building constructions. Application of fireproof paint can be executed solely by persons qualified specifically for this practice whom were issued valid certification. Application has to be performed exactly in conformity with technical regulation for application.